“You did just right to keep guiding the Qi with your awareness. You’ve been practicing Qigong for a long time now, and it shows! Just make a note of where any stuck place is located and continue guiding the Qi, as you did. Later, you can bring attention to any stuck area and explore what door, front or back, of what chakra is related” (for more on the Microcosmic Orbit and chakra influences, see our book, Chi and Creativity: Vital Energy and Your Inner Artist, © 2007, Blue Snake Books, pp. 224-234). Our chakras, with their emotional intelligence and the sensations they generate are our teachers. A blockage in the flow of Qi in the Microcosmic Orbit; an area of darkness; recurrent physical symptoms like a headache or a knot in the stomach, constipation, or jaw tension – they lead us to what in our life is calling for attention. In Chinese Medicine this means not just physically, but energetically, mentally, emotionally, and spiritually, as well. Besides addressing the physical source of the ailment, one might ask of an occipital headache: What’s happening in my dream life, or, How is my imagination longing to express itself? One might ask of constipation: What am I holding on to that I no longer need? Of a knot in the solar plexus: How am I not being true to myself? 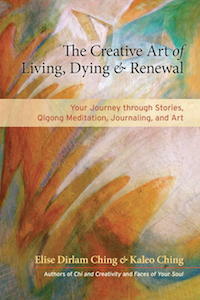 Kaleo shares his story of bringing healing to this area for himself through Qigong and self-hypnosis (from our book, The Creative Art of Living, Dying & Renewal, © 2014, North Atlantic Books, pp. 183-183). A few years ago, Elise and I were back in Hawaii visiting my parents. Mom, seventy-nine years old, was in her fifth year of Alzheimer’s, and Dad, at eight-six, insisted on being her sole caretaker. It touched me to watch them holding hands while they walked slowly, mom shuffling, in the local air-conditioned mall. Mom could no longer speak. Her eyes had an emptiness to them, and sometimes she didn’t even recognize me. I felt a deep sense of loss and grief. Years later on the anniversary of her death, I’m in California, at home recovering from a bout with bronchitis. I’m lying comfortably on the futon, with my finger-pads pressing gently into the hollows of my shoulders (Lung 1 acu-points). Recalling how loss and grief triggered many episodes of bronchitis and pneumonia as I grew up, I dialogue with my lungs for healing. Closing my eyes, I greet my breath, this old friend, who has been with me for sixty-five years. Its comforting rhythm lulls me into relaxation. My lungs invite me to enter. They’re kind of silvery gray. I recognize the grief. It’s dark, heavy, round-shaped, fuzzy on the edges, almost prickly. It feels very old. Whoosh! I’m in Hawaii, it’s four thirty in the morning, and I’m eight years old, in bed, hiding under the covers. My parents, in the kitchen, are screaming at each other. For months they’ve been arguing and threatening divorce. I fold my hands in prayer, “Jesus, please help me! What have I done wrong? How can I make things better?” Suddenly, an intense cold fear shakes my body. The floor is being ripped away from under me, and I feel myself falling helplessly into a black void as huge as the night sky. An understanding emerges. Loss, grief, and fear will always be there, but I have a choice. I can let them either bring me down or make me a kinder teacher, healer, and companion on life’s journey. My breath beckons me back into my lungs. I stand and move in Qigong to massage and nourish my lungs. They also want to be cleansed and wrapped in white light. On inhaling, I visualize pure white light entering and filling my lungs. On exhaling, I make the sound of Hsss and visualize heaviness and dark grief leaving my lungs. The grief does not fight or resist but becomes smaller, softer, pinkish-gray, and pliant. With each breath my lungs feel healthier, stronger, clearer, and filled with pure white. 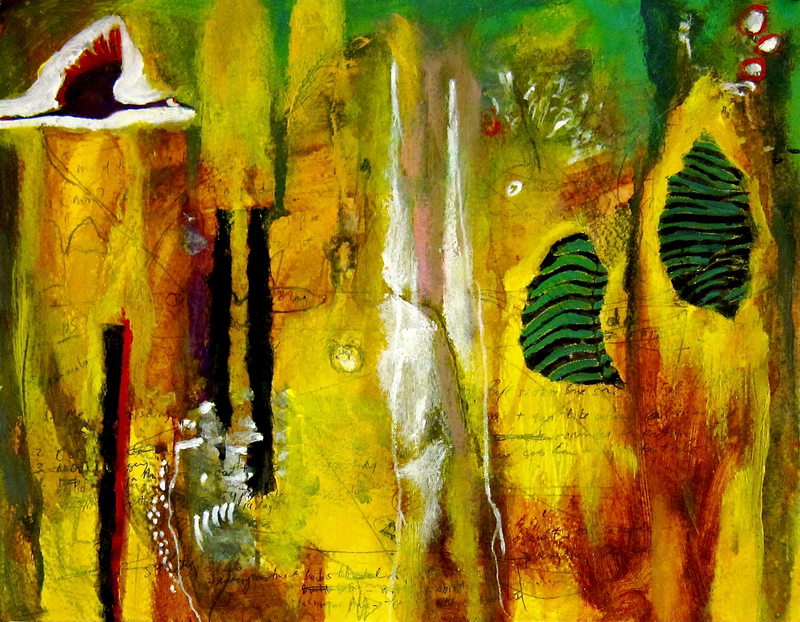 This entry was posted in Chinese Medicine, Qigong, Qigong and Chinese Medicine and tagged Chi and Creativity, Five Elements, Kaleo Ching, Metal Element, Microcosmic Orbit, The Creative Art of Living Dying and Renewal on January 13, 2015 by eliseching.